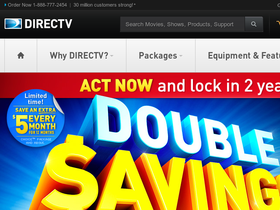 DIRECTV, online at directv.com, offers television the way it should be - direct and easy. DIRECTV offers a variety of top channels appealing to everyone, including sports television and hit TV shows. With DIRECTV, it's possible to record shows and movies on one HD DVR and watch later in any room in the house. DIRECTV also offers plans, and DIRECTV partners with internet and phone providers to offer triple play bundles designed help customers cut costs. Plus, DIRECTV offers options for playing your favorite films and shows on your laptop, tablet, or smartphone. But before you get the best in television from DIRECTV, save with all the latest directv.com discounts, DIRECTV promotions, and DIRECTV coupon codes found here at RetailSteal.com. Save $100 on your new account with DIRECTV when using this coupon code. Click link to start now and save. Use this coupon code at DIRECTV and enjoy $10 savings every month. Click here to save. Save $5 on every month for 12 months when you sign up today for DIRECTV and get a free Genie upgrade. Click here to start. Get free handling and professional installation of DIRECTV. Click here to get started. Get a free upgrade to Genie from DIRECTV for a limited time only. Get it today and connect up to 4 rooms on one HD DVR. Save an extra $15 on your monthly bill from DIRECTV when you purchase a phone, internet, and TV bundle plan. Click here to find out more and save. Get DIRECTV from as low as $29.99 per month. Click here to watch your favorite shows and sports events..